This 1944 design was powered by two BMW 003 jet engines and was armed with two MK 193 30 mm cannon on each side of the fuselage and one MG 151/20 200 mm cannon in the nose. 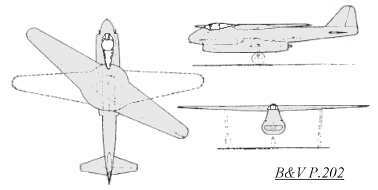 The real star of this design was the variable wing, which was achieved by rotating the whole wing spar, up to 35 degrees. This was believed to have the advantages of higher maximum speed when in the 35 degree sweep position and better handling when in the straight position. Because the fuselage was filled with wing-rotation machinery, the landing gear extended down from the wing mainspar, and were very long.